Available Text to Speech Voices on your computer can be viewed from Control Panel. For Microsoft Windows Vista, Open Control Panel and open Text to Speech Panel, available voices are listed under Voice Selection drop down. For Microsoft Windows XP, Open Control Panel and open Speech Panel, available voices are listed under Voice Selection drop down. 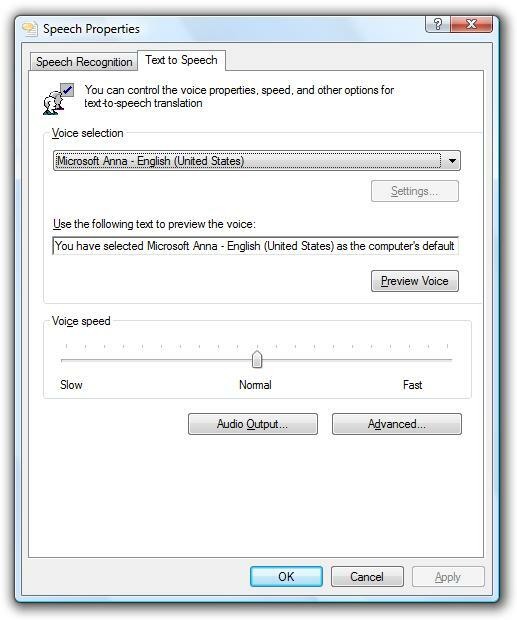 You can also preview voice from the Text to Speech Panel (for Windows Vista) or Speech Panel (for Windows XP). You can get more Text to Speech Voices from internet, once installed they would be listed in the Text to Speech or Speech Panel. The Text to Speech Voices can be used to Speak text from .txt files, .pdf files, read web pages and more. The Voices can also be used to convert text to audio files (.wav, mp3 etc). The Turn Off Monitor Software Download supports, converting text to .wav file & converting text to speech / voice, using Text to Speech Voice configured in the Control Panel. Navigate to Text to Speech Home.